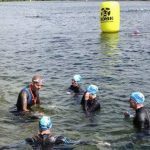 Whether you like to take part in swimming recreationally or whether you race, swimming in open water is a very enjoyable activity. Through our highly experienced and enthusiastic coaching team we are able to provide you with a choice of 1:1 or group coached sessions that will introduce you to the open water environment and ensure your enjoyment and success every time you swim outdoors. All of our workshops are led by ASA / STA /BTF Level 2 Blueseventy accredited coaches. Your session will start with a dry land briefing, theory session and assessment of your needs. This is followed by a full hour in the water working at your own level. By the end of your swim session we aim to ensure that you are able to swim safely, confidently and effectively in open water. As you progress, or for experienced swimmers, we will cover open water skills such as starts, drafting, sighting, turns & transitions. The course includes wetsuit hire, silicone swim cap and even a hot drink to finish. Held at a venue of your choice, at a time to suit you we provide a 100% tailored session to meet your exact needs. Because we tailor each session to you it does not matter if you new to open water or an advanced open water swimmer. As a swimmer looking for an edge on your opponents or simply looking to improve your own ability, you will gain maximum benefit from this session because it is all about you! You will complete the session with a clear improvement path and take away action plan to help you continue your improvements. 1) All sessions must be booked in advance. 2) Athletes are required to submit a health assessment and athlete profile at the time of booking. 3) Your booking will be confirmed upon receipt of full payment. 4) If you cannot attend your scheduled booking you must inform us asap. 6) All short notice cancellations, inside of 7 days will be charged at 50%.